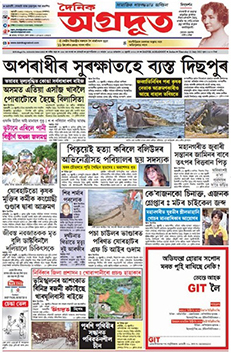 Dainik Agradoot (Assamese: দৈনিক অগ্ৰদূত) is a leading Assamese daily newspaper, owned by the Agradoot Publishers Pvt. Ltd. The headquarters of Dainik Agradoot is located at Dispur in Guwahati. The newspaper as well as its epaper is respected by the readers primarily because of its Editor-in-Chief, Kanak Sen Deka. He is a well known litterateur and former President of Asom Sahitya Sabha. Pranjal Sen Deka is the Editor of the newspaper. Dainik Agradoot is published simultaneously from Guwahati, Jorhat and Tezpur.